Capitalism in space: The smallsat rocket company Interorbital (IOS) today released a short video showing a successfully static fire test of the upper-stage engine for its Neptune rocket. The IOS rocket team successfully completed the first test of Interorbital’s NEPTUNE series launch vehicle’s liquid upper-stage rocket engine (GPRE 0.75KNTA). Engine performance was well within its design parameters, generating a sea-level thrust of 750 pounds and a sea-level specific impulse of 245 seconds. This translates to a thrust of 1,000 pounds and a specific impulse of 300 seconds in a vacuum (with expansion nozzle). The ablatively-cooled rocket engine is powered by the hypergolic combination of White Fuming Nitric Acid (WFNA) and Turpentine/Furfuryl Alcohol. These high-density storable auto-igniting propellants power all IOS liquid rocket engines. Interorbital’s N1 launch vehicle utilizes two GPRE 0.75KNTA engines for its second stage and a single GPRE 0.75KNTA engine for its third stage. I have embedded the video below the fold. This is the first real news update from Interorbital in months. In April 2017 they looked like they were close to a launch, but until today there were no further updates. Part of the issue appears that they changed their approach for manufacturing their rocket in order to save cost, and this might have thrown a wrench in their schedule. Capitalism in space: The video below the fold shows the process by which Interorbital Systems built a rocket test tank for the Neptune smallsat rocket it is developing. It is definitely worth watching if you want to see the future of complex manufacturing. Robotic equipment does most of the work, in a precise manner that would be impossible for humans, which therefore allows for the construction of engineering designs that were previously impossible or too expensive. Now, such designs can be built relatively cheaply, and repetitively. Hat tip Doug Messier at Parabolic Arc. The uncertainty of science: Astronomers have spotted a new very big storm on Neptune, occurring unexpectedly near the plane’s equator. 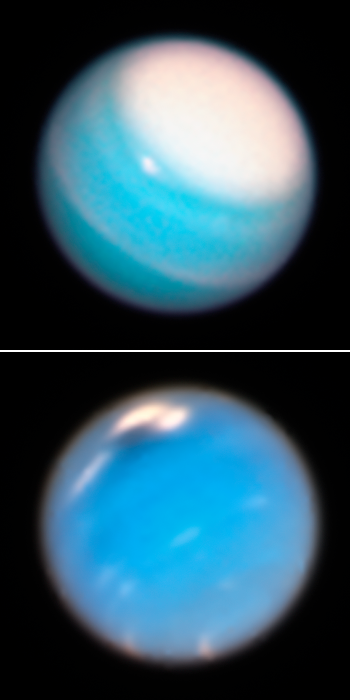 A large, high-pressure vortex system deep within Neptune’s atmosphere is thought to drive the white storm clouds. As methane gases rise up in the vortex, they cool below the condensation temperature, forming clouds in the same way that water vapor does on Earth. Neptune is the windiest planet in the solar system, with observed equatorial wind speeds of up to 1,000 miles per hour (450 m/s). Since wind speeds vary drastically with latitude, a storm crossing more than 30° of latitude should quickly break apart. Something, such as an underlying vortex, must be holding it together. But a long-lasting vortex right at the equator would be hard to reconcile with our current understanding of the planet’s atmosphere. I think any theory about Neptune’s weather should treated with a great deal of skepticism. I am sure the theories are based on what is known, but what is known is very little. Until we have been able to observe this gas giant up close and for decades, our understanding of its weather is going to be sketchy, at best. Capitalism in space: Interorbital, a smallsat rocket company building what they hope will be the world’s smallest and cheapest rocket, have announced that their first test rocket, Neptune 1 Guidance Test Vehicle (N1 GTV), is nearing completion. During the test flight, the rocket will simulate an orbital launch trajectory by using the main rocket engine’s throttling capability to vary the thrust-to-weight ratio, thus simulating the actual conditions that will be experienced during an orbital launch. After the rocket passes through the transonic phase and Max Q, the engine will gradually throttle down, slowing the rocket until it begins to hover. At this point, the rocket engine will be shut down and the rocket will be allowed to fall. At a safe altitude, a parachute will be deployed for vehicle and payload recovery. They then plan to follow this with an orbital test flight. No dates however for any of these test flights have as yet been announced. Using restored images taken by Voyager 2 when it flew past Neptune’s moon Triton 25 years ago, scientists have produced a new map and movie of the moon. More information here. The movie can be viewed here. Using archival Hubble images astronomers have rediscovered a moon of Neptune lost for twenty years. Astronomers using the Hubble Space Telescope have discovered another moon orbiting Neptune. Astronomers have concluded that the high levels of carbon monoxide that they have detected in the upper layers of Neptune’s atmosphere are the leftover fingerprint of a cometary impact some 200 years ago.